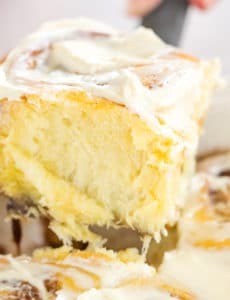 Soft and fluffy cinnamon rolls with tons of filling and a cream cheese glaze on top. Make the Dough: Combine the bread flour, sugar, yeast, and salt in the bowl of an electric mixer fitted with the dough hook. Add the eggs and milk and mix on low speed until the mixture forms a ball around the hook, about 4 minutes. Increase the speed to medium and mix until the dough is very smooth, 5 more minutes. Continue mixing the dough on medium speed and add the butter 1 tablespoon at a time, mixing well to incorporate after each addition. All of the butter should be added over 3 minutes of mixing. Transfer the dough to a large, oiled bowl, cover with plastic wrap and let rise for 1½ hours. (The dough is very enriched, so it may not expand much.) Transfer the dough to a parchment-lined baking sheet and pat out into a 1-inch-thick rectangle about 8 inches by 11 inches. Cover directly with plastic wrap and refrigerate overnight. Make the Filling: In a medium bowl, stir together the melted butter, brown sugar, granulated sugar, cinnamon, and nutmeg. Let the mixture firm up to a spreadable consistency at room temperature. Reserve at room temperature. Assemble the Cinnamon Rolls: Preheat the oven to 375 degrees F. Generously grease a 9x13-inch baking dish with softened butter. Lightly flour your work surface, then turn the dough out onto it. Remove the parchment from the dough, and flour the top surface of the dough. Roll the dough out into a ½-inch-thick rectangle, about 12x20 inches. Dollop the prepared filling all over the dough, then use an offset spatula to spread the filling into an even layer, spreading it the whole way to the edges. Starting with the long side closest to you, begin to roll the dough into a tight spiral. Using a serrated knife, slice the finished roll into 12 equal pieces. Arrange the rolls inside of the prepared baking dish, leaving about ¼-inch of space between each one. Cover the rolls loosely with plastic wrap or a clean kitchen towel and let rise in a warm place for 30 minutes. Make the Egg Wash: In a small bowl, whisk together the egg yolk and milk to combine. Brush the top of the rolls with the egg wash and bake until they are golden on the surface and the filling is bubbly, 25 to 30 minutes. Remove from the oven and cool for 15 minutes. For the Cream Cheese Glaze: While the rolls cool, whisk together the cream cheese, powdered sugar and vanilla extract. Spread evenly over the cinnamon rolls. Serve warm or at room temperature.